So, do you think today's computing landscape of desktops, laptops, notebooks, smart phones, tablet computers, and netbooks - among other designations - is confusing? Imagine a computing landscape with no particular point of reference outside of mainframes and terminals. That's exactly what it was like in the world of personal computing from the mid-1970's to the start of the 1980's. The terms "laptop" and "notebook" were still several years away, with "portable" computers describing those systems you carried about like an overstuffed suitcase and ran off of AC power (like the Osborne 1 , Compaq Portable , or the Commodore SX-64 ), a form factor many of us more accurately refer to today as "transportable" computers. In any case, continuing along the same line of thinking started with my blog post, "Do you know what and when the first recognizable modern day personal computer with BASIC was? ", or my related segment on Armchair Arcade Radio - Episode 1 (and with which I will pursue a somewhat similar theme in Episode 2), I thought I would describe how the 1979 book by noted writer Steve Ditlea, Simple Guide to Home Computers, classified the personal computing landscape of that time. First off, in Part I, Home Computer Fundamentals, under Chapter 1, The Home Computer Revolution, it calls the Altair 8800, the "world's first home computer". In Part II, Choosing a Home Computer, and specifically Chapter 7, it starts off with "Programmable Video Games" (which is the name of the chapter). The systems he designates as programmable video games (and in the last part of the chapter refers to them as "starter units") are the "Odyssey2 Computer Video Game System", the "Bally Professional Arcade", "Cybervision 2001", and the "VideoBrain". Ditlea calls the Odyssey2 a "price breakthrough", though it's arguable to me if the North American version of the Odyssey2 ever really qualified as a computer in the traditional sense. It does in fact offer a very nice Computer Programming cartridge - which is mentioned in the book - but never any ability to save your output. If it qualifies under that scenario, then the BASIC Programming cartridge for the Atari 2600 would also make that console a computer, albeit even more primitive than what was offered on the Odyssey2. At least in the case of the Atari 2600, though, Spectravideo did eventually come through in 1983 with the CompuMate add-on, which not only added a keyboard and a reasonable BASIC, but the ability to save your data to tape. Ditlea says, "In 1978 the VideoBrain became the first computer system sold in department stores". "...the $500 VideoBrain drew the greatest response for a new product in the history of Macy's in New York and San Francisco." Too bad that momentum quickly left the VideoBrain. It's interesting that the VideoBrain is put in this category of "Programmable Video Games", seemingly mostly on the basis of this being the first computer to utilize cartridges. Unfortunately, Ditlea makes a small gaffe, which may have been due to pre-release hype, saying, "For users who want to create their own programs, there's a cartridge that provides STRUCTURE BASIC, a version of BASIC that facilitates financial programming." In fact, the opposite was true. VideoBrain only released an APL/S programming cartridge and in fairly limited quantities at that (along with the limited quantity Expander 1, which was the only way to interface with a tape deck for storage). That's why today - though still a rare and valuable system to collect - it's not used much by its owners, including me (though, as always, there's a small chance that could change in the future). In fact, the VideoBrain creators - much like APF with their unsuccessful PeCos computer - all but dismissed the need to have a BASIC option and felt that their respective programming languages were the superior option. Indeed, innovation is a good thing, but if you go overboard, well, you end up like the VideoBrain and PeCoS--historical footnotes. 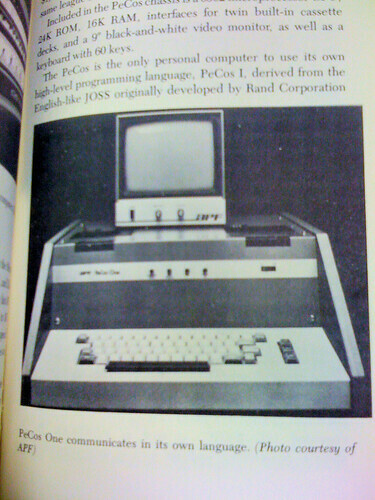 Chapter 8 is "Compact Home Computers", and there are only two systems in this classification: TRS-80 and Commodore PET 2001. It seems his only reason for putting these two units in this special category is the fact that were always sold in conjunction with a monitor, making them self-contained in a way. Of course only the PET was a true all-in-one, with display and tape deck in a single sleek unit. Frankly, Ditlea would have been better off either expanding this category a bit, or simply putting these systems into the next chapter and tweaking its name. 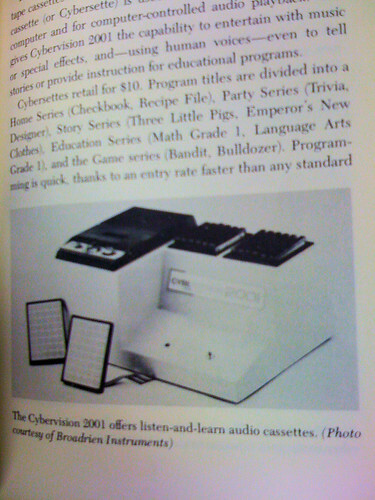 Chapter 9 is "Keyboard Mainframes", and it seems like the computers are categorized as such if they have their CPUs crammed into a case with a built-in keyboard, but are not necessarily sold in conjunction with a matching monitor, which again, is the only reason I can fathom why the TRS-80 was placed in the prior category. Before "personal computer" or "home computer" really caught on, "mainframe" and "mini-computer" were often leveraged to help make sense of these new fangled devices, so "Keyboard Mainframes" is not entirely from the realm of the bizarre, but it's still an interesting choice of words that seems to imply in a way that they're more powerful than some of the other categories, which is certainly not the case (most computers in most of the categories were more or less on equal footing or could be made to be on roughly equal footing). Regardless, the systems listed in this category are: Ohio Scientific Challenger IIP, Compucolor II, Exidy Sorcerer (the second ever cartridge-based computer, plus it could do the dual data/audio thing on cassette), Apple II, and the SOL-20. Chapter 10 is "Component Systems", which we refer to today as "kit computers", which essentially means that the end user is responsible for putting together most of the components him or her self, if not build nearly everything from scratch. "Mainframe" again rears its head, as in this opening passage, "Component systems start with a ruggedly built mainframe chassis enclosing a power supply, cooling fan, bus connectors, a microprocessor supporting circuitry on a CPU board, and plenty of slots for...[a list of add-ons]." Further, "Though bare-bones mainframes can start at around $500, by the time you add all the necessary circuits and peripherals, a component system can run into the $5,000 - $10,000 range." That's of course in late 1970's dollars, which equates to roughly $16,200 - $32,500 today. The systems listed are: Altair 8800b, APF PeCos One (which I previously mentioned and will have to more to say about in a moment), Z-2, Digital Group System, Heathkit H8 (which I've shown photos of the ones in my collection before and am having a modern day clone built for me), IMSAI 8080 (the WarGames movie computer), North Star Horizon, Poly-88, and the Vector Graphics Vector 1. Now a few of those choices, like the Poly-88, are debatable whether they belong in this category, but I think there's no debate about where the APF PeCos One belongs--as a "Compact Home Computer" to help out the TRS-80 and PET 2001. It is a self-contained unit with two built-in tape drives and an external monitor. As mentioned, its main language - rather than BASIC - is PeCos I, a derivative of Rand Corporation's JOSS language. Ditlea's main reason for including it in the "Component Systems" category is not a good one as this quote illustrates, "PeCos (an acronym for Personal Computing System) resembles a large (18 1/2" x 19 1/2" x 18 1/2") all-in-one compact, yet its $1,695 price tag and business-oriented software put it in the same league as the component systems." So, Mr. Ditlea, if it's strictly a business system, does it really belong in your book on home computers? As you can see from just the examples in Ditlea's book, the 1970's were an interesting time for home computer terminology, with some reasonable and not-so-reasonable classifications. Naturally, by the 1980's, the landscape began to solidify a bit, with straight up "personal computers" covering most system types, with the occasional modifier if a system was "pocket" and "portable" with "notebook" and "laptop" eventually becoming more common terms as well. Certainly other form factors and designations would come and go, like "PDA", which probably saw its peak in the late 1990's before the category began an ignominious decline in the face of increasingly powerful cell phones. Though the terms "Tablet PC" and "Tablet Computer" have been around for quite some time, it really took until the release of the Apple iPad for the terms to be bandied about on a regular basis and as a more specific device category (a case of a particular device hijacking a previously established term). Though the pace has slowed dramatically, I have no doubt that new computing form factors will arise and we'll go through more awkward naming phases until a commonly accepted designation sticks. It seems like that's the way things go with emergent technologies. Very interesting. I was born in 1978, so this is really a bit before my time, although by the time I was 4 I was already programming the Atari 400 and Vic 20, as well as of course playing games on them such as River Raid, Radar Rat Race and Star Raiders. It seems to me that the landscape changed a heck of a lot in those 4 years! Yes, I would say the period from 1976 - 1979 were truly the formative years for the personal computing industry in terms of establishing reasonable standards and shaking out the first batch of also-rans. There were some wonderful experiments in that time, though, and some truly forward-thinking designs. Too bad the relative costs were so high and the relative funding was lacking, because it would have been nice to see some of the designs outside of the Apple II, TRS-80, and Commodore PET make it into the next decade. I was a software developer for the CyberVision 2001 from its inception to its demise. My business partner and I developed its operating system and, with the rest of our software development team, all of the nearly 30 applications for the CyberVision. We have CyberVisions in the attic and, the last time we checked, they still worked. We also have copies of all the applications that were developed. Myself and Ken Balthaser, one of the original CyberVision software development team members, reunited 35 years later (in 2012) to produce a game for the iPhone and iPad. There more information about our background and the game at the game's web site - www.startruxgame.com. Life comes full circle -- Two guys that worked at the leading edge of home computers in 1978 are reunited 35 years later to work together at the leading edge of mobile computers. Thanks for sharing that with us, John. There is criminally little information for the platform available. If you have extras to sell, there would certainly be interest. In 2012, a Neil Balthaser got in touch with me via email and mentioned that his dad worked there when he was a kid. Apparently they threw a Cybervision anniversary party a few years prior for all the founders. If I had more time, I think the Cybervision story would make for an interesting book, a la my recent "CoCo: The Colorful History of Tandy's Underdog Computer." Can you confirm if that was actually released and sold to the public? The only pictures of it anywhere online are just to the Montgomery Ward catalog, and not of the actual unit. There's not even photos of software. No emulators. It appears that it was canceled before it shipped. Also, it looks more like a game console, a la Bally's Personal Computer (later renamed to Astrocade). Was it like that; more of a video game console? See here: http://gamasutra.com/blogs/MattPowers/20140228/211946/A_Brief_History_of... . I've seen units sold on eBay, though not many, so it almost certainly was sold. None of those that were sold were prototypes. It is exceedingly rare, though, and I don't personally know of anyone with one in their collections. I was John's business partner and co-founder of the company that developed the CyberVision 2001 (3001, and 4001) and I can tell you that the product was released and sold nationally by Montgomery Ward in 1978. We had an order from Ward's for 10,000 units of the initial product configuration (pictured in the Ditlea book) that we fulfilled, and a new form-factor (model 3001) was released on a second round of orders from Wards. We also developed a prototype of a much sleeker looking 4001 model, which included an extended adaptation of Ron Cenker's floating point BASIC in ROM. That model was never manufactured in quantity. I won't get into it in this reply, but it turns out there is a connection between the CyberVision lineage and the Astrocade/Bally system. As John mentioned, we have several working versions of each of the models produced (including the 4001 prototype) and the entire software library (over 40 titles) for this RCA 1802-based home computer.